When your turn begins, place 1 power counter on Lady Liberty. click, click, click: Add an agenda from HQ to your score area worth agenda points equal to the exact number of hosted power counters. How does Lady Liberty Work? Can the Corp use Lady Liberty to turn an agenda into a different number of agenda points? The phrase "worth agenda points equal to the exact number of hosted power counters" is a qualifier to "an agenda". The Corp can only use Lady Liberty on an agenda in HQ that is already worth as many agenda points as there are power counters hosted on Lady Liberty. The ability cannot change the number of points on an agenda because it is not a conversion effect using the word "as". 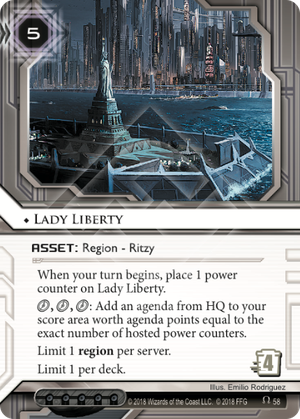 ​​This card reminds me a bit of SanSan City Grid, expensive to rez, expensive to trash and it enables fast advance and MCA Austerity Policy as it enables scoring 5/3 agendas within one turn and needs some loading time. You can only "score" agendas that have the exact same agenda points as power counters on Lady Liberty. That means after rezzing at the end of the runners turn you can score a 3/1 the next turn, afterwards a 3/2 or 4/2 and then a 5/3, meaning you can use it to score 6 points over 3 turns. The advantage is, besides rezzing (5 creds) you don't pay anything but clicks and this way you would save the 12 credits needed to score 6 points (net 7 credits) and it has a high trash cost. From my point of view, when you can use it to score a 5/3 it was worth it's investment. On the other side, you are not scoring the agenda, which means agendas with "When scored" abilities like Nisei MK II, Elective Upgrade or Project Atlas are not that valuable with this card, the agendas give you points but don't support the agenda ability. It works best with agendas without "When Scored" abilities, like: Global Food Initiative, Obokata Protocol, The Future Perfect or passive abilities like AR-Enhanced Security, Gila Hands Arcology and The Cleaners. Thus making NBN (Near-Earth Hub: Broadcast Center & NBN: Controlling the Message) a very strong contender for using the Lady. Additionally you should consider to run a mixed agenda composition to enable to use Lady Liberty as often as possible. On the other hand it gets useless when you have 4 power counter, but no agenda with 4 or more points within your deck. What you need to consider as well, "Clot lock Shaper" is not an issue, as Clot is preventing you from scoring and you are not scoring agendas anymore (and there is no install), the same applies for The Source and Traffic Jam as it's increasing advancement requirements. To sum it up, strategies that prevent fast advance don't work against Lady Liberty! On the other hand, an Employee Strike (or any other current) will stay active. So in this regards it's like a Film Critic for corps, you will not be able to deactivate currents this way. It makes the most sense in a deck that can rez it quite cheap e.g. Mumba Temple or put it in a heavy ICEed remote. So the Runner gets broke when trashing it and as a result opening a scoring windows. So in this regards it's comparable to MCA Austerity Policy. And in an asset heavy deck you might be able to recur it with Team Sponsorship, but that would mean the runner has thrashed it or you overwrite it and score an agenda the hard way to be able to recur it. For recursion you could also use Preemptive Action but how to find it again? Or you use Restore which is fine with a 1x card! The question is how to use it? Do you have the agendas in hand? That means the runner can snipe them out of your hand or do you hope to draw them? Both has it's risk. Are you able to defend your remote, your HQ and R&D at the same time? When you want to draw the agendas some filter like Daily Business Show or additional draw like Rashida Jaheem, (and of course the banned Sensie Actors Union or Estelle Moon) come in handy. On top of that, having Jeeves Model Bioroids enables you to use the Lady and have another click for doing things, which puts pressure on the runner. The downside is, it's 1x per Deck restriction, so you need to have cards to find it, like Tech Startup but this means telling your opponent what you plan and they can prepare for it and the Startups are cheap to trash. And you can only rez & load your Lady in the next turn. Or you use it as a must trash Asset which is 1x per Deck and if you find it fine, but it's an additional way to win. It's influence free. That is a plus. Full Jank with Helium-3 Deposit is possible, so you can score Government Takeover or Vanity Project. e.g. You need to score Helium-3 Deposit the hard way, have the Lady in a server, so when you score it, you can place 2 power counter on it. When you rez it end of the runners turn, next turn you have 3 power counters on it and can score a 5/3 next turn. Or it's ticking already and you immediately are in Vanity or Government Takeover range, will you have it in you deck? Can you fetch it with Fast Track + Biotic Labor to win the game? Or you have your 4x Advanced Helium-3 Deposit and rez the Lady end of Runners turn, so you can score it, place the power counter on the Lady and then you use your 3 counters to place a 5/3 from hand in your score area. The ID where it might shine the most is Blue Sun: Powering the Future assuming it's not Employee Striked. It can be used to score Agendas and then pull it back into hand to start from scratch with little payment (1 click) and of course the slot in the remote server.